I've been tweaking the blog a bit. If you look over that way ----> you'll see a clickable Recipe Index. Thanks to Jacqueline of Tinned Tomatoes for the code to make that work. Moving the recipe index off the top bar gave me room for some essays (recipe-free ramblings, really) I wrote way back in the fall :) when I started this blog in case you just feel like reading a bit. Let me know (comments or on my FB page) what you think! On to the food. This, probably more than anything else, illustrates how I feed my family from our CSA farm share all year 'round. This dish contains 4 roasted veggies: garlic, roasted after I harvested it and frozen in early summer, eggplant and bell peppers, marinated in a vinaigrette and roasted and frozen when I was overwhelmed with veggies in late summer, and sweet potato, roasted for another use and left over in the fridge. 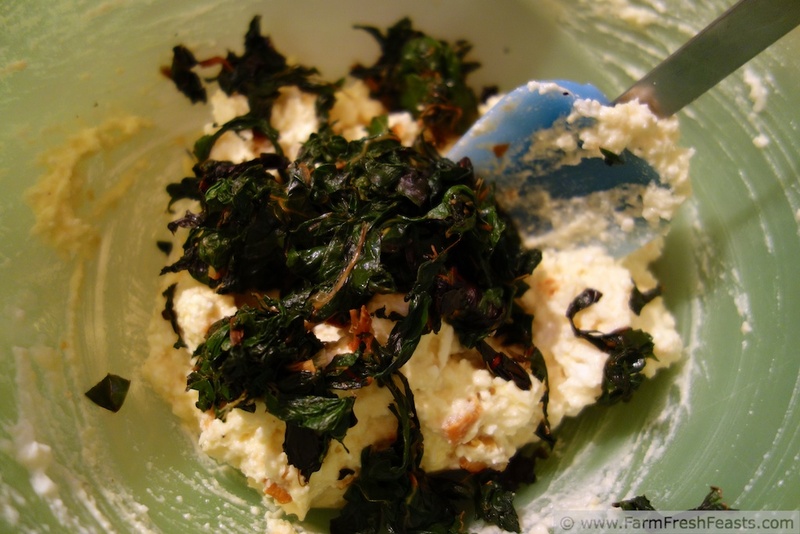 The mock florentine refers to the liberal use of Swiss chard in lieu of spinach. I used a bunch of fresh chard (stems in the sauce, leaves with the noodles) in addition to incorporating leftover Creamed Swiss Chard. (If you're keeping track, the Leftover Score is now at 2). 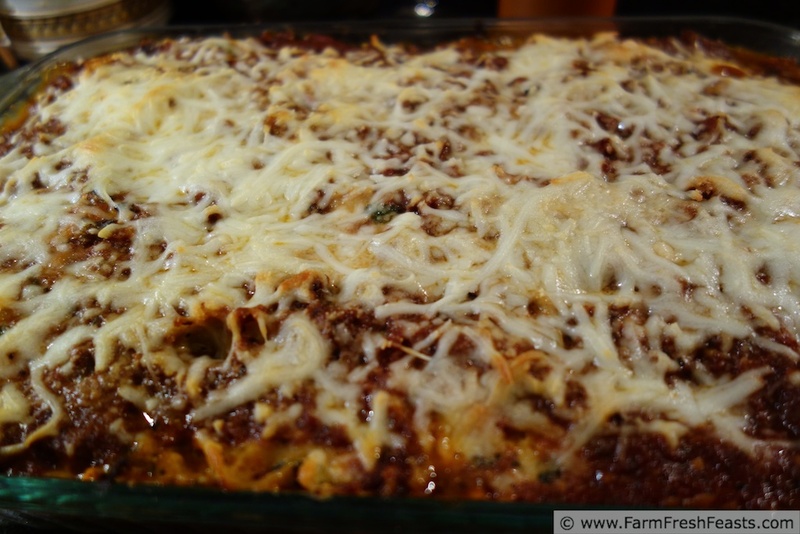 The mock lasagna refers to the fact that, although I have a well-stocked pantry, I didn't have any lasagna noodles. Yes, I could go out and buy some, I'd rather use up what I already got. Hence the crazy convoluted name. I walked in the door after an afternoon wheelchair basketball exhibition game with the idea that I wanted "something good" for dinner but having no clue what that would be. Seventy-five minutes later I was putting this dish in the oven. It's not a 'quick take', but to go from cluelessly scratching my head in the middle of the kitchen to completed, ready-to-bake Quadruple Roasted Mock Palooza impresses me. Then again, I'm easily impressed. Having the roasted veggies and the prepared pesto put up, and a freezer full of potential pizza toppings, means that making this truly does illustrate my goal of feeding my family from our farm share--all year long. Smooth and ready to go into the skillet and meet the beef. Preheat the oven to 350 degrees Fahrenheit, get a large pot of water for noodles heating, and heat a large skillet over medium heat. Add a turn of oil around the skillet. Sauté onion and chard stems 8-10 minutes until softened. Transfer to a large bowl. 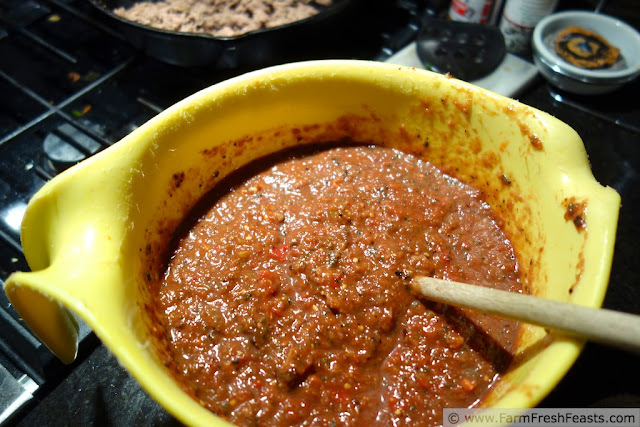 Add ground beef to skillet, brown and drain. In the large bowl, combine the roasted vegetables--including garlic, pesto, tomatoes, tomato paste, and wine. 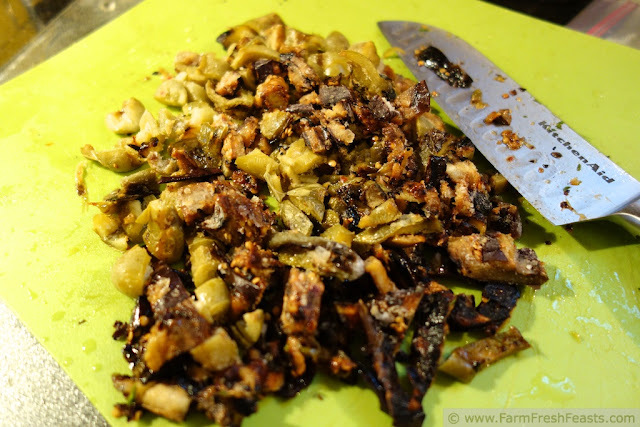 My kids don't care for chunks of eggplant (though they like the eggplant flavor) so at this point I used an immersion blender to smooth out the bumps. Pour the resulting sauce into the skillet with the ground beef. Add the pepperoni and sausage. Simmer gently over medium-low heat for 20 minutes, stirring occasionally. While the sauce is simmering, make the cheese filling. In a large bowl, combine ricotta, cottage, and parmesan cheeses with Alfredo sauce. 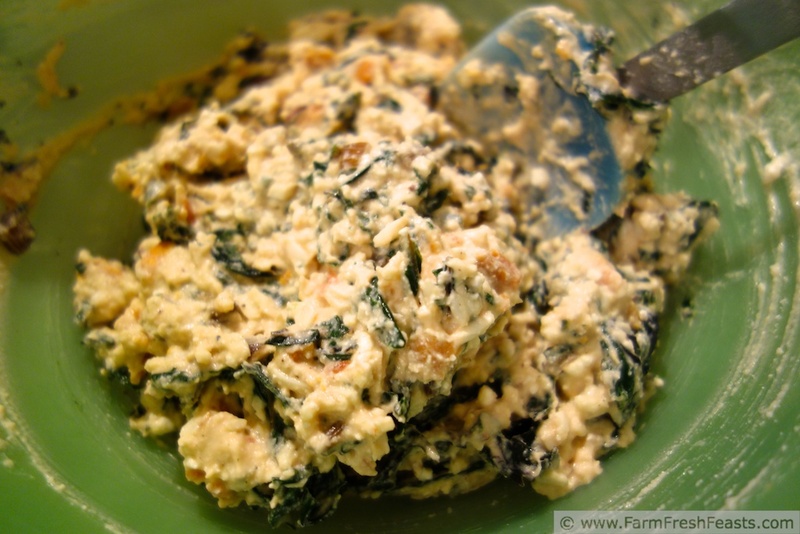 Stir in egg, 1 and 1/2 cups mozzarella cheese, sweet potato, and chard leaves. Fold in cooked noodles. Spread 1 cup of sauce across the bottom of a 13 x 9 inch baking pan. Layer half of the noodle mixture, then half of the sauce. Repeat layers. 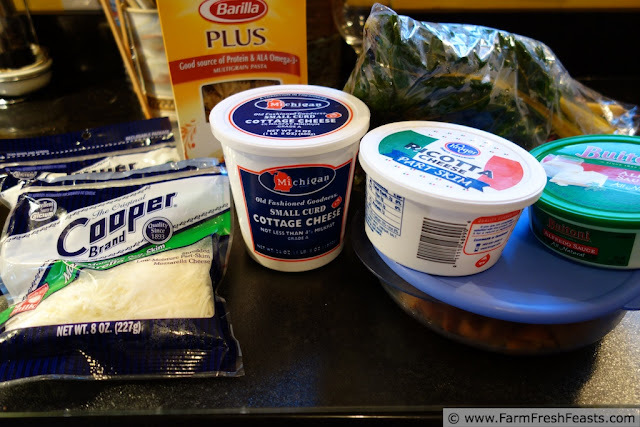 Top with remaining 1 cup mozzarella cheese. Bake for 45 - 60 minutes until edges are browned and bubbly. Prepare this dish while wearing a Mock Turtleneck, if you like. 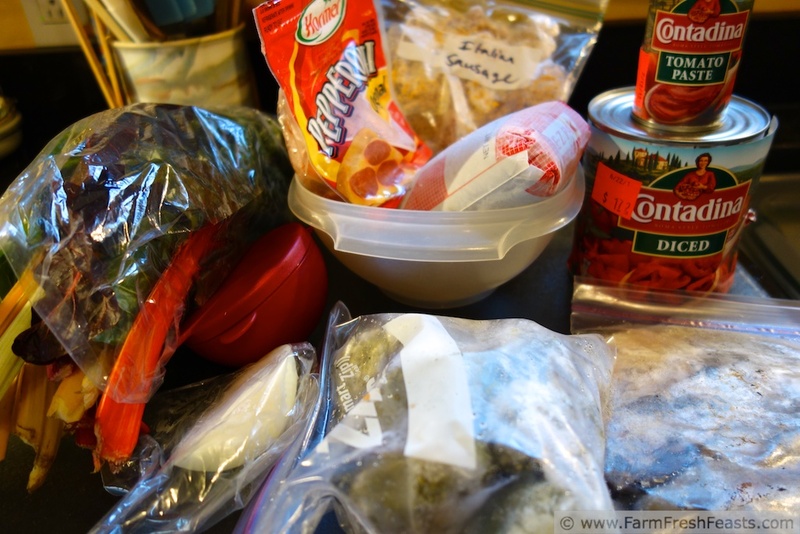 This post is linked up with the Wednesday Fresh Foods Link Up at Gastronomical Sovereignty. Am I the only one excited to use up so many open containers/cans? I *love* the name! lol Very creative use of foods. I wonder what veggies I can hide in the next pasta dish I make? Oh, and I love your recipe index. In fact, I might have to steal that idea myself! I do not advise hiding beets, as the color usually gives it away. I've put beets in a blueberry smoothie, and more recently in a chili, but those were probably lucky shots. As for the recipe index--steal away please! Just go to Tinned Tomatoes (I linked to it above) and she's got some blogging how-tos on the lower right hand side of the page. I copied and pasted until I got the hang of it. And if you can figure out how to make the index work on the left hand side (mine covered up text on the main post) please share. Since I'd like to have something on the left, too. Great photos too.. makes want some right now! I am in awe of you! I can never make it into the summer with my freezer stash. I read in awe of the way you "put up" and then really use vegetables and other foods. It's a great skill - an art even - and you nail it. PS re your new index, first, congrats! and second, you might want to expand it, even now. For example, look how long the pizza list is already and you've only been blogging a short time. Plus for those who follow your blog and want inspiration for the chicken that's in the fridge, wading through all the non-chicken recipes would become a chore. Just a thought! I hesitated putting this recipe up because it's not really something one could do at home, more of a suggestion on how I make the farm share work for our family. I am mulling over this recipe index thing. In the blog of my dreams, without the constraints of Blogger, I have an A to Z index like yours with veggies separated out. I'm not sure how to make it all work, but it's in the 'churning in my brain' stages now. I'd be thrilled with that many empty containers. 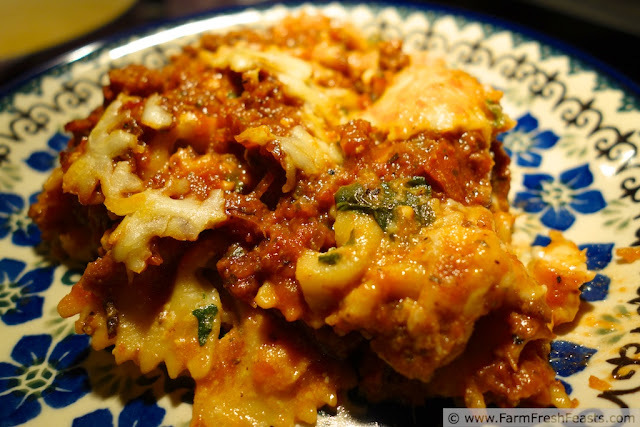 Score for the good guys, and I'm digging the recipe name and the fact you used Farfalle. Classic. And awesome. Thanks, Meghan! Apparently I didn't make enough bow tie pasta salads in the summer to polish off the box. No worries, I'm down to angel hair and linguine now. You need to do a sautéed garlic and olive oil sauce with the angel hair. Maybe some crushed tomatoes...mmmm, it's perfect for such light and thin pasta. Meghan--that sounds fabulous! I've still got roasted garlic in the freezer, and both slow roasted tomatoes (freezer) and crushed tomatoes (canned). I'm on it, and I'll report back here! Great use of freezer and pantry! And there's something so satisfying about being able to eat from your CSA share all year round. You have no idea how ridiculously flattered I am that you have come and commented on my little blog. i think i'm in love right now kirsten. both with the cheesy oozy dish filled with everything from your CSA and your new recipe link side bar. 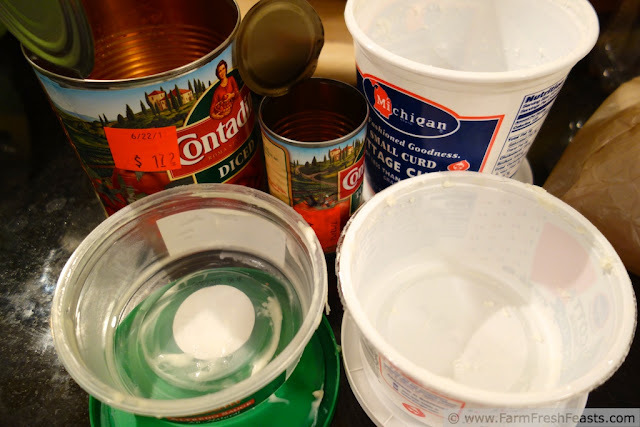 nothing makes a good blog more of a good blog than easy to access recipes. that didn't make much sense but you know what i mean. I (and my that I mean my spouse) just fixed my blog email. Recipe index, functioning email. What's next?